Tubular Ceramic Capacitors - Corry Micronics, Inc.
For over 30 years, Corry Micronics, Inc. has been manufacturing tubular ceramic capacitors for use in their own filtered products. CMI now sells these same high quality ceramic capacitors direct to companies needing filters in their products. CMI has more than one hundred types and sizes of tubular ceramics already in production. For over 30 years, Corry Micronics, Inc. has been manufacturing tubular ceramic capacitors for use in their own filtered products. CMI now sells these same high quality ceramic capacitors direct to companies needing filters in their products. CMI has more than one hundred types and sizes of tubular ceramics already in production (Download the standard list). 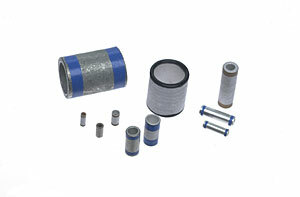 CMI’s tubular capacitors are offered in “C” and “Pi” circuit types. Working voltages range from 50V DC to 1,000V DC and are manufactured using several different dielectric materials that range from a K of 20 to 11,000 for extrusion and up to 16,000 in pressed dielectrics. Temperature coefficients range from NP0 thru Y5V. Custom ceramic blends are also available.